For as long as I can remember living in Utah, Gardner Village has been the king of themed events! Which is why I was not only shocked but also very humbled that they were willing to work with me for the first annual #FairyDanceParty, during their annual woodland fairy festival. If you’ve been going to Gardner Village over the years, you may have noticed a big change in the Mill Plaza area with their gorgeous renovation and a new pergola. They have completely transformed the space to make it a dream destination for outdoor events and weddings. I was excited to come in and put my personal touch on it to make it magical for the #FairyDanceParty. Honestly, very little decoration was needed because of all of the fresh flowers, shrubs, beautiful pavers and the structural beauty of the plaza. This space is absolutely breathtaking and it made the perfect dance floor for all of the fairies to come shimmy and shake their fairy wings. I have to hand it to Gardner Village, they were one of the easiest venues to work with, only because they are an event machine and did so, so much. Normally I’m in charge of everything. And I mean everything, organizing every aspect of the full event, from food, activities, decor, and swag. But they stepped right in and did so much to make this event come together and feel absolutely perfect. Their catering service took care of all of the hors-d’oeuvres and beverages which were as absolutely gorgeous as they were delicious. Obviously, it’s a dance party, and the ladies come to mingle with their girlfriends and dance the night away. The lovely Belle Jewel came to serenade us with a few songs from her new album! You might remember her from The Voice a few seasons back! She’s a local celebrity everyone and we are so lucky that she came to sing for us! If you get the chance, go over to her spoitify and take a listen, she is so talented and all we listen to these days. For this event, I wanted to try a few new things to allow more guest participation like limbo and a few games and honestly I was a little hesitant. I was hesitant because I didn’t want to make this event feel like a child’s birthday party. What if the guests were’nt receptive and all I got were crickets and blank stares? I guess there are worse things in life, but I was FLOORED with how responsive you ladies were! Oh. My. Gosh. the games were hilarious, and the limbo contest was the most amazing thing I’ve ever seen! Like ever! It was insane to watch so many of you kill it doing your limbo thang. #Contortionists There are no words, I was 100% blown away. After replaying “How Low Can You Go” about three times, we finally called a tie between these two lovely winners (who litterally could limbo under a two foot bar)! Bravo ladies! Lovely ladies from Lipsense came to give all of the fairies beautiful long lasting lips with a DIY Jewel bar to bedazzle yourself if needed, which if you’re wondering, was needed. If you ever aspire to look like a snapchat filter, make sure to hit up my hair and makeup girl, Chayse. She is Magic! 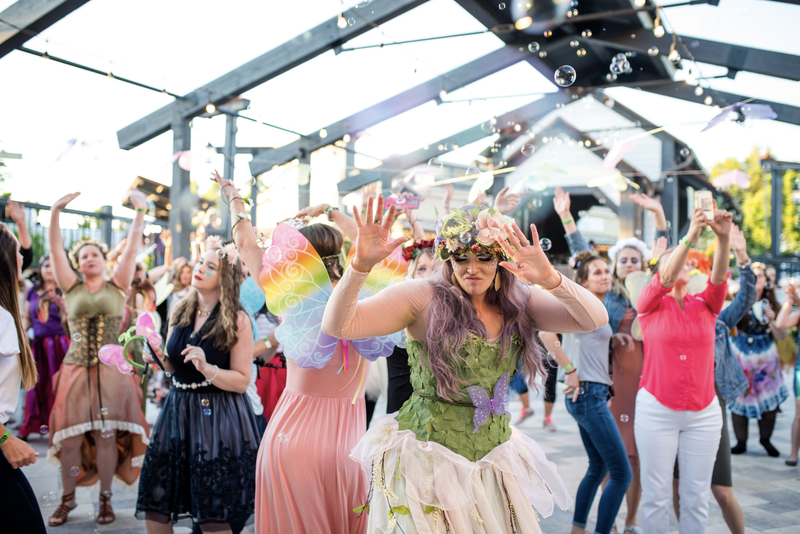 All of the gardener village shops got involved to make this event absolutely over the top with their swag scavenger hunt, and swag bags full of gift cards, pixie sticks, chocolate and jewelry! My lovely Photographer Tabitha and Videographer Holden did an amazing job of capturing this event and I’m so excited to do it again next year! Once again from the bottom of my heart, thank you, thank you! These events are only possible because you ladies come, share and invite your friends. I feel truely blessed to be able to do them and I can’t wait to see all of you at the next one!